Every so often, usually when I’m visiting the USA, people do a double-take when they find out my name. 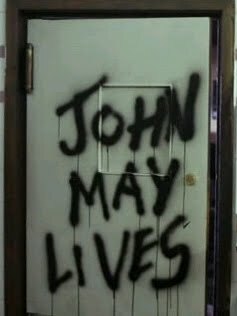 “John May,” they question, “aren’t you a character in ‘V’?” http://v.wikia.com/wiki/John_May I normally smile, nod and admit to being an urban legend. Earlier this year, in the middle of a large reception held in Philadelphia to celebrate the Queen’s Jubilee, I introduced myself to a random group of American royal aficionados, waiting patiently to meet HRH Prince Edward, whom I was accompanying. “John May,” said one man, “John May… I used to know a John May. He was a wonderful man. An antique dealer in London. He helped me start my collection of royal commemoratives. He was married to an Australian. She was pretty wonderful too” I was able to let him know that the wonderful man was my father… and that I’d be able to pass on his best wishes to my equally wonderful mum. I’ve met one or two other John Mays on my travels. There’s one in Lewes, Sussex, an investigative journalist, who writes an excellent blog called The Generalist. There’s another in Lichfield, whom I met years ago when I was a teacher there; this year he was one of the Olympic torch-bearers. But, of course, there are a whole lot of other ones. So, this evening, I thought I’d emulate Dave Gorman and Google my name to see who I might find. The first entry Google came up with was Wikipedia… 17 John Mays – including a car mechanic killed in the St Valentine’s Day Massacre, a 19th Century English cricketer and a former archbishop of St Louis. Rather surprisingly, Wikipedia lists me twice in the 17, although one of the entries is tagged as possibly not meeting Wikipedia’s general notability guideline. Google images has some very interesting mugshots… I particularly like the picture of Lieutenant Colonel John May, constructor of Basingstoke’s town clock in 1887. A letter to the Basingstoke Gazette calls for an annual “May Day” to celebrate his life and works. Google told me that there are 522 LinkedIn entries for John May. My namesakes, as one might expect, bridge every conceivable sector and management role. There’s a mention of my dad again in the Google listings – as the creator of the infamous “You’re never alone with a Strand” advertising campaign. And, a little further down, I see that the campaign (and Dad) have been featured in the Oxford Dictionary of Modern Quotations. Dad’s obituary in the Daily Telegraph is listed too. There are websites for funeral directors and butchers, a note on the contributing editor to the Star Wars Official Monthly Poster Magazine, the John May museum of natural history in Colorado Springs and a firm of solicitors in Kensington. …and there are a few mentions of Scouting, the Duke of Edinburgh’s International Award, Young Enterprise and Career Academies. But perhaps the best entry of all was a blog article by the aforementioned John May from Lewes. In “Planet May”, he talks about the various John Mays he has found on a Google search. Not only do we have the same name. We also share the same narcissistic leanings.